Today every piece of our land is being secured fraudulently by outsiders. Our landscape and demographic balance has been tempered with. What the Portuguese could not destroy in 451 years is being done away with in less than 70 years of our “independence”. With eyes set on filthy lucre and short term gains, we have lost so much that was precious and dear to us. Many many years ago when we were young, we used to roam freely in the city of Margao or ride around the villages to while away our time. The atmosphere was clean, the air we breathed pure, the scenery eye-catching. There were open spaces aplenty and vast expanses of greenery. We would have great fun! Yet at the end of the day, back home at night, we often exclaimed: "Goa after 9 pm looks like a cemetery. If this was Los Angeles or Europe, there would be so much development!" We longed for what we didn't have. But then came Goa's liberation and with it, development... a sea of ill-conceived development in which we are now drowning. First came the big hoteliers who bought large stretches of our coast from Goans themselves, who were too eager to sell their properties for the attractive sums of money they got. Then came the Delhiwallas with hard cash and again Goans were only too willing to part with ancestral property and large stretches of land in exchange of short-lived wealth. Some Goenkars migrated, others invested in fixed deposits. No attempt was made to draw any concrete plans to invest in something worthwhile that would keep future generations glued to Goa. Then the successive Governments (MGP, BJP, Congress and the Coalitions) rose to power to loot and plunder Goa. Soon things were in fast forward mode. Development monsters came haunting us like IFFI, Regional Plan 2011, SEZs, Sports City, Mopa International Airport and Panaji-Vasco sea link. All 40 MLAs colluded to make the most of their hidden agendas: "self-development" programs meant to line their own pockets (with a zero-plan for social development). One classic case of ill-conceived development in Goa is, for instance, the Housing Development scheme - otherwise a basic need of humankind. The world over every government promotes housing schemes to provide more and better housing amenities to their citizens. The average Goan needed a lot of help in the form of opportunities to improve their living situations. But he was betrayed. Under the pretext of development, Goan politicians have been exploiting Housing schemes only to further their nefarious agenda. What is more, as their abominable tactics help create new vote banks, Goans are shown the door. It is not surprising then that clearances to all such housing projects are being scandalously issued without any application of prevailing rules and regulations. Further the new mantra followed seems to be "Construct first, infrastructure later" (which means never). Truly the promise of better infrastructure remains a pipe-dream. No effort whatsoever is made to augment the prevailing facilities in basic needs like water, electricity and approach roads. It is big money that rules the roost as of today. Clandestine deals are struck with the promise of huge kick-backs to politicians and their coterie. Moneyed builders from all over the world thrive on illegalities while they easily manage to get agricultural land, forest areas, land debarred under CRZ regulations "converted". Mega-projects, where Goans can't even dream of securing a job or finding a roof over their heads, raise their ugly heads overnight. Today every piece of our land is being secured fraudulently by outsiders. Our landscape and demographic balance has been tempered with. What the Portuguese could not destroy in 451 years is being done away with in less than 70 years of our "independence". With eyes set on filthy lucre and short term gains, we have lost so much that was precious and dear to us. The destruction of our coastline, for example, has been done with complete disregard of coastal regulations. More than 10 percent of the 105-kilometre (65-mile) coastline is congested with haphazard, unauthorized "development". Almost all the tourism hotspots in Goa are reeling under problems of overflowing sewage, water shortages, contaminated groundwater, coastal erosion and congestion to the brim from an emphasis on tourism of ‘numbers'. Goa is caught in a mining trap as mining pollution continues to play havoc with the environment. In villages rivers run dry, wells have no water and mining rejects spill over into local fields. What is more frightening is that a Mafia has taken to illegal mining. Since some of the Ministers and their kith and kin are hand-in-glove, the Government looks nonchalantly the other side. The last nail into the Goan's coffin is the Government's non-stop land acquisitions under the pretext of development - ‘land grabs'. Acquisitions are being made for one purpose but later the land is seen being used for an entirely different purpose. Goans havewoken up to the reality that the sudden mushrooming of slums and concrete buildings in acquired lands has social, cultural and psychological consequences; which may not be evident to the casual observer. The loss of Goan identity is a very serious matter today and is drastically changing the environment in Goa - physical, social and cultural. This poses a threat to their identity. Needless to say then, there are attempts to strike at the core of ‘Goanity' providing the basis for much insecurity on the part of every Goan, until then deeply connected with his/her place of origin, time-honoured traditions and cultural background. Our little piece of paradise is being destroyed. 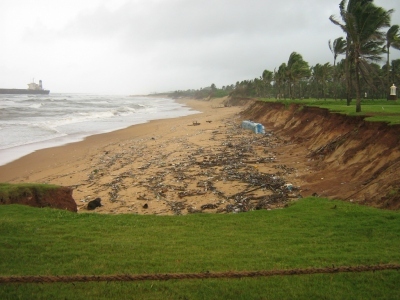 Our greedy politicians have allowed what is worst in "development" to be transplanted into the Goan soil. Certainly we can do without this kind of "development" in Goa - a development which kills the soul and destroys the culture which has been the mainstay of the Goan society from time immemorial. Goa does not need the model of development which has proven to be a failure elsewhere. What we need is socially cohesive, sustainable and, above all, a morally sound model of "development". Wishful thinking? Perhaps. Yet, hope springs eternal in the human breast. It is shocking that this writer is actually trying to prove that the Portuguese were better,He puts the independence of Goa in inverted commas ! Does he know the evil Portuguese history of Goa or other colonies ? He need not travel more than 10 kms. from his native Margao to know the cruel and evil deeds of Portuguese ...he has only to visit Rachol fort cemetary and read the epitaphs of the Portuguese destroyers in 16th century Goa ..who destroyed 279 temples in a single month ! Another Portuguese Afonso lies buried in Portugal who slaughtered more than 6000 moirs/ muslims in then capital of GOA, known today as old Goa...he not only butchered able bodied muslim soldiers but pregnant muslim ladies ...and your inquisition...do you know anything ,writer ? Can you pl tell me why do we have so many Goan catholics[ I am not mentioning Hindus,here ],in Mangalore and near by ? what made them leave Goa..lock,stock and barrel...when they were ruled by their co-religious Portuguese ?WHY ? This is to Mr. Amit and Gautam Borkar.............. Please don't mind but it's TRUE. Most of the Indians, When asked by an other national or by other fellow national as to from Where are you or Who are you? The first reply which comes from their mouth is not that ............... I'am an Indian, but they tell the name of the State which they belong to from India. Now tell me, Who are these Indians ? Indians NEVER Support other Indians when they really have to do so.... If Indians donot trust Indians, especially when they reside and work in a country where they really have to think that we are Indians than WHY should we show the nationality where we are not in need of? that's in India...... The Peace, Culture and Communal Harmony of Goa reserves the right for every goan soul to call a non goan an outsider. Outsider is not a bad word i think, it's not refered to somebody as an Alien, idiot or an irrational creature but only to a person who is not originally from Goa. But some similar character samples like GBA make the things get spoiled when they themselves don't even know to slice a potato. press for saving what is left of our land. submitted a plan to build a hotel on same piece of land. body.But has been advised to build a housing estate. Sorg ami ravtat tea gharachea durga meren soponk favo na. Paradise must not end at the boundary wall of the house we live in. This all our own doing.Not to mention our attitudes such as 'the so called crab mentality.' We goans have been too lax in our attitudes.Many of my Indian brethren think, that since they are Indians and Goa, being a part of India, they can do whatever they want, without any sence of responsibility. If you see the way Goa has been plundered, may it be the so called outsiders or politicians et a all, the originality of Goa, has been devastated and the results are in frount of our eyes, which a nongoan will not appriciate. We goans have given our own self, for exploitaion, for others and since now, that we have realised our mistake, we should all try, to correct it, and together. Most importantly, by being united Just the way, our father Mahatma Gandhi set an example, we goans too, should follow the same.Unfortunately, the goans are the first to colaborate in the evil designs of the outsiders without foresight.Praying that in the future all this will change for the betterment of GOA !We should never lose hope. The article is cry in the wildernes, and sounds almost like an obituary! Sad but true I doubt anything can done now ! I agree with the good Doctor completely. I live in Mumbai, but keep going to Goa every year since the 70's. Every time I go there I see less trees, forests & more concrete jungles. In the market I could hear only Konkani being spoken, Now less konkani & mostly Hindi & some south indian language are to be heard. The very culture of Goa is changing & sadly goans are themselves to blame for this. It is time locals not only welcome 'outsiders' [for the sake of tourism] but also keep their goaness with them . The political leaders have to take the first step for that to happen else Goa will go the Mumbai way. Cant understand the fact why you refer to non-goan indians as "outsiders"/"delhiwallahs". As far as i understand Goa is merged with the Indian Union and every person has the right to own property anywhere in India. Why dont you question Goans who own property in places like Mumbai/Pune yet Maharashtrians do not call us outsiders and put blames on us. I totally agree with Amit that our own people are also greedy! 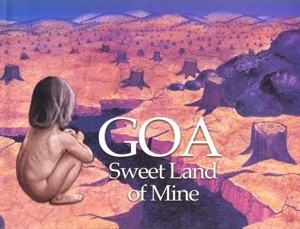 Are the politicians who have spoiled Goa and resorting to all nefarious activities like unscrupulous mining, excise duty evasion, allowing drug peddling, working as agents for selling Goan land and houses all over the Globe, demanding commissions and cuts for every and all sundry public works, taking money for giving jobs or in a way auctioning every Govt. job Giving huge money to buy votes, casting votes by accepting money or other favours,- Are all of those rogues outsiders?-I feel along with the politicians, a section of our voters too has become corrupt and lost all morals and ethics and values. They have become so selfish that they continue to elect the same corrupt people again and again for petty selfish gains! I think till the society learns to castigate and look down on the corrupt, criminals and people who get rich through unfair means, things could never improve! Infact I hate to see the kids in many of the schools being given prizes at the hands of the same criminal and corrupt people, who are out to decimate and cause irreversible harm to this beautiful State! It is high time the intellectuals and right thinking people wake up to these harsh realities and launch a mass movement to clean up the muck! I think it is wrong to think of other Indians as Migrants .... I would only say that many Goans who boast about their success are outside Goa and are treated as Indians..also they buy homes and properties outside the state. So why should not any other Indian buy land in Goa? OK now let's see who wants to pocket money by doing these deals, Politicians, Babus, Middlemen(Brokers), OUR own Goans in the various Govt depts for some amount of cash. Lawyers who are in Goa are the first in line to make money ..bcoz to make any deal the lawyer has to be from the State. How come it is the fault of an "Outsider" if our own people are greedy. We are competing socially to have a car a bungalow and lifestyle .. and hence are becoming greedy for wealth .. then it does not matter if the wealth is gotten without a foresight. We should have had many politicians like Dr Francisco Colaco, but now it is too late, my only worry is next politicians will be migrants.